You, too, can make Pizzoccheri Pasta at home! Today, I will once again stray from the Bartolini recipe file and show you how to make another pasta. This one, made with buckwheat, is called pizzoccheri, and originated in the most northern part of the Italian peninsula. I first heard of this pasta, and its namesake dish, from a fellow blogger “MusingMar” when she shared the recipe for this unusual dish last February in her blog, Life Through the Kitchen Window. If you’ve not met Mar, I hope you take a few minutes to visit her WordPress “home”. Similar to my documenting my family’s recipes for future Bartolini, Mar is gathering her recipes as a gift for her children. And what a gift it will be! Her blog features delicious recipes that are well-written, easy to follow, and beautifully photographed. One day, her kids will thank her but, in the meantime, we’re welcome to have a peak and even “borrow” a few. When Mar posted her recipe for pizzoccheri, she called it “Italian Comfort” — and is it ever! This pasta dish features potatoes and cabbage, with some butter, garlic, and sage thrown in for good measure. Oh! Did I mention the Fontina and Parmesan cheeses? Yes, this is one hearty dish, made even more so by its buckwheat noodles. And this is where I got involved. When Mar posted her recipe, she mentioned that she makes it with regular fettuccine since she’s been unable to find buckwheat noodles. She asked if I could be of help. Well, I love a challenge, so, of course I agreed. First, I searched the web and learned that the dish originated along Italy’s border with Switzerland. As Mario Batali is quick to point out, the northern districts of Italy use eggs and “double zero” flour in their pasta dough and, as you travel south, the flour is mixed with semolina and water is used with the eggs. When you get to the very south, the dough can be all semolina with little or no egg used at all. Well, since this pasta came from the extreme north, chances are its dough was all double zero flour and eggs, without any semolina or water used. Knowing that, I began searching the web and weeded out recipes that didn’t seem to have originated in the north. One memorable recipe used Grappa and Vermouth!?!? Seeing that, I decided to go ahead and trust my own instincts. Based roughly on Mom’s dough recipe, I used a 4 to 1 ratio, meaning 2 cups of buckwheat flour and ½ cup of all-purpose (AP) flour. I also used 3 eggs but the dough was too dry and I had to add some liquid. An egg would have been too much so I added about 2 tbsp of water to the food processor. After it rested for 30 minutes, I treated it like I would any pasta dough and cut the pasta by hand. In all, I ended up with a little over a pound of pizzoccheri pasta. While they cooked up just fine, the pasta broke into small pieces when everything was assembled for the oven and, although the finished dish tasted great, it certainly wasn’t the most appealing thing I’ve ever served myself. Not only that, since I used the entire batch of pizzoccheri pasta in the dish, I had plenty — and I do mean plenty — of pizzoccheri to eat during the following week. As luck would have it, pizzoccheri week was followed by the boiled dinner days of March. One could say that I enjoyed more than my fair share of cabbage during that time period and pizzoccheri was off of the menu for a spell. Finally, this past Friday I decided to try again. Having spoken with Zia, we agreed that my first attempt failed because it needed more gluten to hold the noodles together and that I rolled the dough too thin. This time around, I used 2 parts buckwheat flour to 1 part AP flour. Again, I only used eggs and the dough handled much better, although still not as easy as regular pasta dough. Once the dough was made, I followed Mar’s recipe and this time the noodles “survived”. This pizzoccheri was not only delicious but it looked great, too. Success! Today’s recipe is from that final, successful attempt. Although I only made 12 oz. of pasta, you can easily adjust the recipe to make more or less, depending upon your needs. As mentioned above, use a ratio of 2 parts buckwheat flour to one part AP flour and I estimate 1 egg is needed for every 75g of flour. Be aware that buckwheat flour is heavier than AP flour and that’s why I used weight, rather than volume, measurements the second time around. (Where volume measurements are given in the recipe that follows, they are my best guess approximation.) Your dough will be a little more moist than normal pasta dough but should not be sticky. This dough dries faster than most and the extra moisture will be needed as your roll it out and cut the pasta. Work quickly and do not roll it as thin as you normally would for fettuccine or pappardelle. Additionally, do not allow the sheets to dry as much as you would normal pasta before it’s cut into noodles. If it is too dry, the pizzoccheri dough sheets will become brittle and break as you prepare to cut them by hand or when passing them through your pasta cutters. As complicated as this all may seem, once you start working with the dough, especially if you’ve pasta-making experience, you’ll see what I mean. Really, it’s a little tricky but not nearly as impossible as this may sound. Place all ingredients in a food processor and process until a dough ball forms, usually within about 30 seconds. Remove dough and knead on a floured surface for a few minutes. Cover with an overturned bowl or plastic wrap and allow to rest at least 30 minutes and no more than 60. If you must rest dough longer than an hour, refrigerate it until you’re ready to roll it out. If using a rolling pin, roll the dough until about twice as thick as you would when making fettuccine. If using a stand mixer rolling attachment or hand cranked pasta machine with “1” as the widest setting, pass the dough repeatedly through the rollers, increasing the number setting each time, up to and including the “4” setting. If your roller gizmo’s widest setting is “10”, pass the dough repeatedly through the rollers, decreasing the number setting each time, up to and including the “6” setting. Allow dough sheets to dry a bit but not as much as you would for normal pasta dough. Cut each sheet into 12 inch sections. Pass the sheets individually through the largest pasta cutters, usually fettuccine-sized. Place newly cut fettuccine aside on a floured surface and repeat the process for all the dough sheets. One by one, lightly flour each sheet, fold it in half, then in half again. Using a sharp knife or pastry cutter, trim off the 2 ends of the folded dough sheet (sfoglia). Cut your noodles. Tagliatelle are no less than ¼ inch (6.4 mm) wide. Fettuccine are no less than ⅓ inch wide (8.4 mm). Pappardelle are no less than ½ inch (12.7 mm) wide. Unroll the cut sections to produce the noodles, place the newly cut pasta aside, and repeat the process until all the dough sheets have been cut. When finished, cover the noodles with a clean kitchen towel and use ASAP in Mar’s pizzoccheri recipe. The dough sheets must be well-floured to prevent them from sticking when folded and cut. Now, I realize that this may seem like a difficult process just to make some pasta, especially for the inexperienced pasta maker. As I’ve mentioned, if you’ve made pasta at home, my precautions will make sense and this will probably not seem so difficult. If you haven’t, I’d suggest you start with a regular pasta dough recipe (see Mom’s Pasta Dough) before attempting this one. This dough is not nearly as “forgiving” as normal pasta dough and, as such, is not a good dough to use when learning the ropes of pasta making. Besides, you can always use regular fettuccine or tagliatelle noodles in your pizzoccheri or, if you must have buckwheat, try soba noodles. Don’t let your noodle prevent you from enjoying a great dish! And thank you, Mar. When all is said and done, I learned both a new recipe and how to make buckwheat pasta. Not a bad outcome. This entry was posted in Home-Made Pastas, Make It Yourself, Pasta/Rice/Soups (Primi Piatti), Vegetarian and tagged Food, Italian, Pasta, Recipes by ChgoJohn. Bookmark the permalink. Hey, Barb! As a general rule, there seems to be more double zero flour, eggs, & butter in the North, with more semolina, olive oil, and hot peppers being used in the South. (Of course, there are plenty of exceptions.) On the web, I’ve read that you can make a good approximation of double zero flour by mixing some cake flour with AP flour. Carol Baker, in “The Italian Baker”, says that Italian bread bakers long for our AP flour. “Manitoba” has become synonymous with good flour. Apparently over farming and some other factors have led to a poorer quality of Italy’s grain and, subsequently, flour. So, I don’t worry about finding “00” flour anymore. I prefer using AP flour rather than semolina only because that’s what I’ve eaten all of my life and that’s what I’m used to working with. I do have semolina flour on hand, however, just in case I come across a good recipe from the South. Before I go changing a recipe, I try to make it the “correct” way first. As always, Barb, thanks for leaving such nice comments! 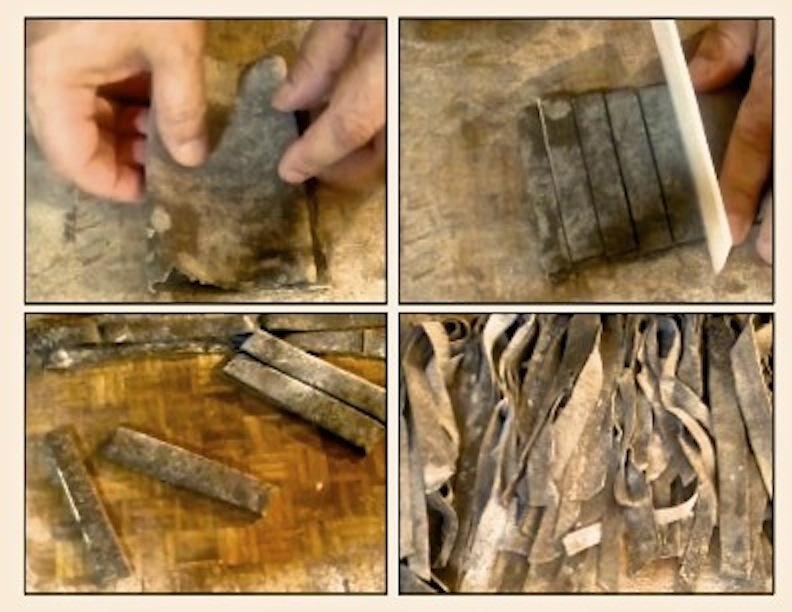 I think I may give soba noodles a try when I make this next time. They certainly would make this dish far more accessible. Put to shame? C’mon, Charlie! Our living situations are vastly different. You’re a busy wife & mother of 3. I’ve a dog & parrot. Hardly the same thing. I could never do “your job” or that of any parent. As for the pasta dish, Mar was right: this is Italian comfort food and with your seasons changing, you’re entering into prime time for pizzochierri. I love it when Wednesdays come round and I get to read your post while drinking my morning coffee! Wel, this is a new one to me and very impressive indeed. I will have to set you a challenge now that I see how diligently you research and produce the perfect recipe. The finished dish sounds fantastic too – potatoes, cabbage, garlic, cheese…comfort food indeed. Have a great rest of the week John…Big Man has requested I make more of “your” ice cream! I’d never heard of buckwheat noodles or pizzoccheri, nor had Zia, until Mar posted her recipe. It’s a great dish, though, and will definitely be part of my repertoire come the cold weather at the end of the year Before that, there’s ice cream to be made and I’m glad your Big Man enjoys it so. In your Flat Ruthie post, I thanked you for the jam recipe but failed to thank you for mentioning the ice cream recipe. Sorry about that and I’m going over to your place to correct my oversight. Well if it’s “Italian Comfort”, then who am I to argue. Well done on all of the research John! You did all the homework for all of us. 😀 Salivating now at the thought of this. And thank you, MD, for always leaving such encouraging comments. I’m glad to hear that, like me, you enjoy Mar’s blog. Pasta making isn’t as difficult as one might think. It’s all about practice. And I’ll see what I can do for you, Teri. I’ve a relative with food allergies and I’m trying to come up with a recipe for her. I’ll be sure to keep you informed if I’m successful. Hang in there! Pasta with potatoes and cabbage is a perfect winter (and early spring) dish, another change to ring on some basic vegetables. Thank you. Italian comfort, indeed! What a dish…I can just taste how rich and comforting this must be with the combo of the nutty and distinctive flavored buckwheat paired with the cabbage, potato and cheese…definitely a meal in a dish. And I love learning new ways to make and eat things with buckwheat. Kudos, John, on another informative, interesting and tasty post and dish. And the “discovery” of Mar’s blog is a bonus, thanks! Thank you, Betsy. This is a great recipe and I’m glad that Mar introduced it to me. And, as you know, I love making pasta and this “challenge” was right up my alley. I’m, also, glad to hear that you, too, like Mar’s blog. I hope you do give it a try, Celi, but don’t be in any rush. You certainly have your hands full right now. I must say, Mama sure did land on the right farm. I can’t imagine, for example, that the pseudo-farmer who sold her would have done anything to help her or her lambs this morning. Mama and her babies are one lucky lot! Ahhhhhh, another pasta to add to our repertoire. Thank you for this, John, Hubby tends to collect pasta recipes to try (he loves making them). I’ll bet it’s wonderful with the pizzoccheri recipe too! Delicious! I think I’ve gone and fallen in love with traditional Italian cooking….thank you SO much for sharing your wisdom, it’s much appreciated! Hi John, while I usually gravitate toward the healthier grains, sadly I just cannot get into buckwheat. That was very kind of you to create a buckwheat noodle recipe for Mar; I will head over to her blog and check it out, after all, you can never have too many friends! BTW I am not loving the way wordpress makes you use your wordpress account to leave comments because I am noticing that it doesn’t link my comment back to my blog. How do you do it John, your name links to your blog? Thank you, Eva. This is the kind of “challenge” that I like — one that results in pasta! I couldn’t lose! Pizzoccheri was new to me, too, Caroline, especially the buckwheat noodles. All you need is some practice and you’ll be making plenty of pasta without any problems. I always use my Kitchen Aid’s pasta rollers to create the dough sheets but never bought the pasta cutters. Most often I cut the pasta by hand with a knife. I have a hand crank machine if I want to make more perfect noodles. Trust me. The way you cook, you’ll get the hang of pasta making really quickly. Do come to Chicago, Kay, and feel free to drop by anytime. Visit in September and October and the weather is great! If you like it hot, come in July and August. Either way, you’ll see why we put up with the sometimes horrendous Winters. With our Lakefront, this city is one of a kind. This looks delicious John. I think I’m going to have to try your mom’s pasta dough as well. I’ve made ravioli and orecchiette before with semolina and water. I had no idea that was the Southern way. 🙂 I think I could seriously live off pasta (and sushi) and I would be a happy camper. One of these days I’m going to slot enough time to make some homemade pasta like you John. I know I just have to get into the groove and then there will be no turning back. Oh btw…no Ziti recipe on your site? I was going to make some tonight and figured you’d be my source. Ha ha. Completely understood, but I look forward to reading your Ziti. My experiment last night with Ziti was not good. John, so kind of you to agree to tutor me along! 😉 I made a lasagna noodle once. It turned out fine, (far better than out of the box) but it’s the pasta from the Bartolini kitchen that I’m anxious to try…one after another of them, until by July 4th we’ll be celebrating with an Italian pasta feast! I’ll begin next week! (Expect to see me hanging around your place a lot!) 🙂 Thanks again! I’m adding your amazing receipes to my limited cookbook. Who knows after all these years I may learn how to cook. You make it appear easy. Thank you for sharing. It is amazing how dishes evolve and change dependiing on location and ingredients available. Thanks for the little background on the topic. What is AP flour? John, I was thrilled to read your post, and humbled by your kind words about my blog. I really wasn’t expecting more than a mention, and was quite moved by your generous credit. Thank you! So many people have stopped by Life Through the Kitchen Window today to visit and leave comments, and some even to follow. Obviously I am not the only person who respects your work and sees you as an authority on Italian cuisine, not to mention a really nice guy. I agree with Spree; the buckwheat noodles make the pizzoccheri look much more attractive than the regular fettuccine that I used. I hope to be adept enough at making pasta one day to be able to try your recipe; right now I’m definitely in the beginner category! Enjoy your pizzoccheri, this batch and the next one in the fall. This is definitely a ‘once or twice a year’ dish! It’s more special that way, don’t you think? You’re very welcome, Mar, and thank you for leaving so gracious a comment. I certainly don’t consider myself an expert of Italian cuisine. I’m lucky to have my Zia as a great source for recipes and anecdotal information. And I watch many of the Italian cooking shows — probably too many. John, just wanted to let you know that I’ve added an update to my post to let my readers know you’ve made and blogged about the pizzoccheri, with a link back to your post. I should have done this much sooner, but as they say, better late … This post is one of my most viewed, and I certainly thank you for encouraging your readers to visit it! I saw that, Mar, and thank you for the mention. It’s a great recipe that you shared and I doubt if I had much to do with the its popularity. I bet you’ll get plenty more hits this Fall, once the weather begins to turn. I know I’ll be making pizzocchieri again! Have a great night! Okay, I freely admit that these noodles initimidate me…but I am glad you’ve pointed out some easier recipes to try. I will have to check them out for sure. I also love all the knowledge I gain from reading your blog – now I just need an opening to bust out my new found noodle knowledge (try saying that five times fast 🙂 ). Thanks, Debra, for coming despite the failings of WordPress. Others have mentioned they’ve had similar problems. I think I’ll send a note to Support and see if they’ll check it out. A fantastic journey from the north, the middle and on to the south of Italy care of it’s pasta. Thank you John, your pasta recipes always “get” me and I’m off for a peek over at the original recipe – it sounds hearty food indeed. Pure comfort would be another way to describe it. And I’m pleased you saved the Grappa for drinking and not putting into a pasta recipe!! I always learn a lot when I read your posts, John, and your explicit instructions make it feel possible to me who has never made pasta. It is hard to admit but true. I think Francine and I need to fly you in to Pittsburgh with your pasta machine. Did you see see the invitation for the Ghanaian meal for you and a tour of the African grocery? Could be a Foodie Frenzy Fest for sure. I’d never heard of pizzoccheri before, mmmm Looks fantastic. I enjoyed reading a bit of the overview on where it originated and the flour ratio too. I never exerimented with buckwheat flour, I’m intrigued! I can see why Mar called this dish Italian comfort food! On this cool damp Friday…. This sounds like a perfect dish. Toothsome pasta and hearty vegetables…. perfect! Thanks for teaching me something this morning. The lesson on the regional variations of pasta was a great way to enjoy my morning. Thanks again! You’re so right, David. This dish was meant for days like today. “Italian Comfort” is the perfect name and description for the dish. It’s ingredient list is so different from any I’d seen previously that I just had to give it a try, especially when Mar asked for help. I’m glad I did and I’m, also, glad that you liked the post. Thanks! It was so nice that you were on a mission to create this pasta for your friend and fellow blogger. And you gave us all the “low-down”. Amazing! The pasta looks scrumptious and the dish decadent as usual. You are such the pasta rock star John! Thank you kindly, Geni. I don’t know about being a rock star but I do love my pasta and welcome any chance to learn how to make a new one or prepare a new dish. This one really worked out well and will make a great addition to the comfort foods I love to make when our weather “sours” in late Fall and Winter. This looks so healthy and colorful! Great meal for a busy weeknight too. I admire all the research that goes into your dishes. The dark color reminds me of squid ink pasta. Thanks, Karen, and if I ever find some squid ink, I’ll gladly post the dish. I dined on pasta made with sepia ink when in Venice and have been on the look-out for the ink ever since. Such an incredible flavor, like eating the sea. Remarkable! Thanks for the pasta lesson, John, I did not know there were differences in pasta making from region to region in Italy. My pasta machine is gathering dust in my cabinet (haven’t used it in years), should dust it off and get back into pasta making. Your posts are always educational and inspiring, thanks. So sorry I have missed a few of your posts John. Life is a little crazy these days. Your mum’s pasta has been on my must make list for far too long and I think I should build up the courage to do it, after I master that I will give this tempting pasta a try. Thank you, Sawsan. No need to apologize. Whether first or last, your comments will always be welcome here. THis is one of the most unusual pasta dishes I’ve seen, and I’ve seen — and eaten — quite a few. This will become part of my Winter “rotation”, to be sure. Your cappellacci dinner sounds wonderful, Kathryn. No matter the cuisine, isn’t it great having a favorite restaurant? In their own way, they generate a certain “cozy” feeling that’s missing in other “new” places. And there’s no hesitancy ordering anything from the menu. You’ve been there more than enough to trust that whatever you select, you’ll be pleased. Hi there! While it’s true that pasta is usually made with eggs in northern Italy, this is not so for pizzoccheri. Pizzoccheri originated in Valtellina, a mountain region, and are therefore not comparable to the traditional pasta made in the lowland areas. So, no eggs, only water. John – just thought you’d be interested to hear that a reader (Michael) just left a comment on my pizzoccheri post about having recently eaten this dish in Italy. He talked about the areas where it originates, and said this dish is referred to as ‘mountain man food.’ You might want to check it out! I did check it out, Mar. Isn’t that something? You just never really know who is going to spot one of your posts and drop a note. Thanks for the shout out but this really is all yours. I’d never heard of pizzoccheri before your wrote your post — and I’m glad you did. Once the temps dip a little lower, I’m making this again! John, your preparation and cooking are absolutely incredible! The way you put your mind, heart and soul into a recipe is impressive! I would not attempt this recipe, but you are not afraid of any recipe! You conquer it! I am intrigued with the buckwheat flour too. It all looks delicious! Thanks for leaving such a great compliment. I took this as a challenge, Judy, and I’m glad I was successful. I’d never heard of pizzoccheri before and it is a very hearty, comforting dish, perfect for the cold, snowy days ahead. Honestly, I’m looking forward to making it again, only this time I may try it with Soba noodles. They may not be “authentic” pizzoccheri noodles but they are buckwheat and a whole lot easier to use. I’m really pleased that you’ve found this post so enjoyable. Thank you. Oh, it is fantastic! thanks so much for sharing. I was doing some surfing on the internet and found this page about the Valtellina dish, Pizzoccheri. I have found your page interesting to read. I grew up eating Pizzoccheri as my Nonna’s family is from the Valtellina valley. Her maiden name is Pollinelli and both her parents were borne in a village called Bianzone, just near Tirano. Anyway, I would like to share my Nonna’s mum’s recipe that was brought to Australia 101 years ago. My Nonna is 93 years old this year. Sift flour into a mixing bowl and add eggs and water. Mix well until it becomes a dough. Roll out and cut into strips (about 1cm wide). Keep plenty of the plain flour so that the dough does not stick to the bench / board. In a large pot boil water with a pinch of salt. Add potato & beans. Cook for 10 to 15 mins then add Pizzoccheri, bring to boil and add cabbage and silver beat. After adding Pizzoccheri, takes about 20 minutes to cook. 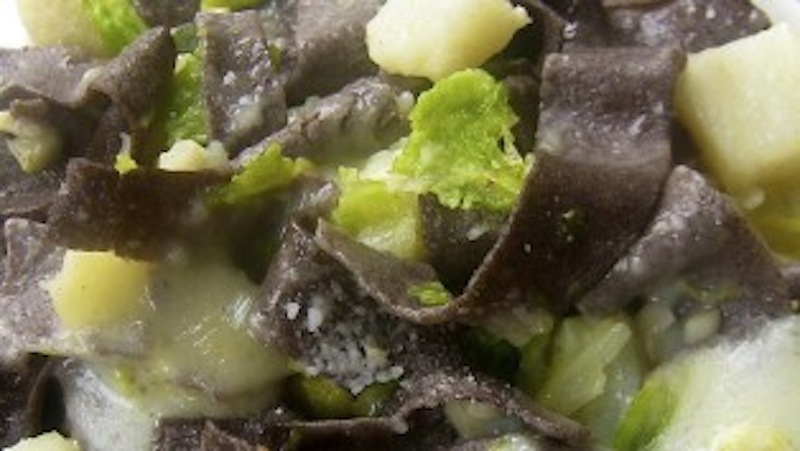 Once cooked, drain water and place into a big bowl in layers of Pizzoccheri and then cheese – grated Romano or Parmesan. Heat up the olive oil in a frying pan. Then fry garlic, butter and oil until brown. Pour over the bowl of Pizzoccheri. It should make a sizzling sound as it is poured over the Pizzoccheri. Uncle Tullio Ronchi would say that if it didn’t make a sizzling sound, then it hasn’t been cooked enough / isn’t brown enough. I have not done buckwheat but I have done whiolemeal/plain mix. It has a much lighter texture than plain flour based …. it is not al dente at all. It will always be a bit more delicate than pure white flour and may need more careful cooking and treatment, but mine works even when rolled to about 6-8 on thre machine. If you are worried about the next egg being too “yolky” and tasty, use just the white of an egg. That will give binding/setting protein without eggy taste. That may allow more buckwheat for a more whole grain texture. It would also be worth trying using egg protein if you want to use gluten free materials. Hello, Nick, and welcome. Mom taught me to make an egg-based dough using AP flour, though I’ve found a source for “Doppio 0” flour and have been using it exclusively now. I’ve not had much luck using other flours but that’s probably because I need to practice with it more. Pizzoccheri requires buckwheat flour and it is a firm dough. There seems to be some disagreement whether to use eggs or water, or a combination of both to make the dough. Nevertheless, it is an interesting dish, very hearty for the Winter. Thank you for visiting and for taking the time to comment.